Chicago: ALA Editions, 2016. 120 pp. I have to admit, I’m instantly intrigued by any book that begins with a chapter called “Get Over Yourself.” It’s usually good advice. It’s focused on a particular audience. The main idea of content marketing is to create content that’s not simply information, but rather info that’s truly useful and valuable to a particular target audience. Other areas of this brief, breezy book outline the differences between content marketing and promotion, explain how to identify audiences by creating personas, discuss planning with editorial calendars, and list common mistakes to avoid. Long sidebars titled Words of Wisdom From the Field are sprinkled throughout the book. Each is a contribution from a marketing expert; these offer extra viewpoints and insights. In the interest of full disclosure, I must say that I contributed one of those sidebars. However, that’s not why I’m giving this book a positive review. I’ve read and appreciated two earlier titles from Laura Solomon (The Librarian’s Nitty-Gritty Guide to Social Media, ALA, 2013 and Doing Social Media So It Matters: A Librarian’s Guide, ALA, 2011), and I’ve listened to more than one of her webinars. Solomon’s points have always been clear and well-made, and her knowledge has always been fresh and relevant. This latest book is no exception. 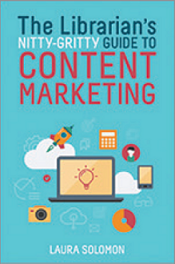 If you want to understand content marketing and begin to take advantage of its power, I recommend this nitty-gritty guide. The writing style is casual and pleasant to read; it’s decidedly not academic or stuffy. To me, this makes learning more palatable. If Laura Solomon writes another book, I’ll read that one too. Kathy Dempsey is a marketing consultant at Libraries Are Essential (www.LibrariesAreEssential.com) and the author of The Accidental Library Marketer. She’s been the editor of MLS for 22 years. Her email address is kdempsey@infotoday.com .